The culmination of a life long dream to create a truly beautiful-yet-accessible lifestyle brand, MARACA was officially born in 2012 in Auckland, the city that founder Chris Lim calls home. Lim sees the key touchstones of the brand as being: luxury, quality and style, with a firm emphasis on harnessing nature’s most effective ingredients. The MARACA collection includes lush, decadent bodycare products as well as home fragrance lines divided by scent, story and inspiration. Each of the collection’s signature scents are designed by ‘nose’ Chris and formulated in France, whilst the range’s candles are individually hand-poured in New Zealand using natural plant waxes for better fragrance throw and a truly decadent feel. The latest release from MARACA ticks all of the right boxes, and is named in honour of the historic Jardines del Generalife in Alhambra, Spain. The Generalife, built between the 12th and 14th centuries, was a palace used by the Muslim kings as a resting place. It was conceived as a rural villa where ornamental gardens, orchards and running water would soothe the soul and still serves as a place of reflection for many today. The new scent is evocative of the famous garden’s moody ambience during the cooler months, and is just perfect for burning right now. With a green, leafy and earthy heart, the fragrance reflects the mist-laden, heavily scented scene which MARACA creator Chris Lim encountered when he travelled to the gardens in early 2015. The green bouquet features fresh notes of Musk and Vetiver to echo the garden’s exotic Moorish history, whilst delicately warming notes of Green Tomato Leaf, Blackcurrant and Wild Fig help conjure the garden’s heady nature during the autumn and winter months. 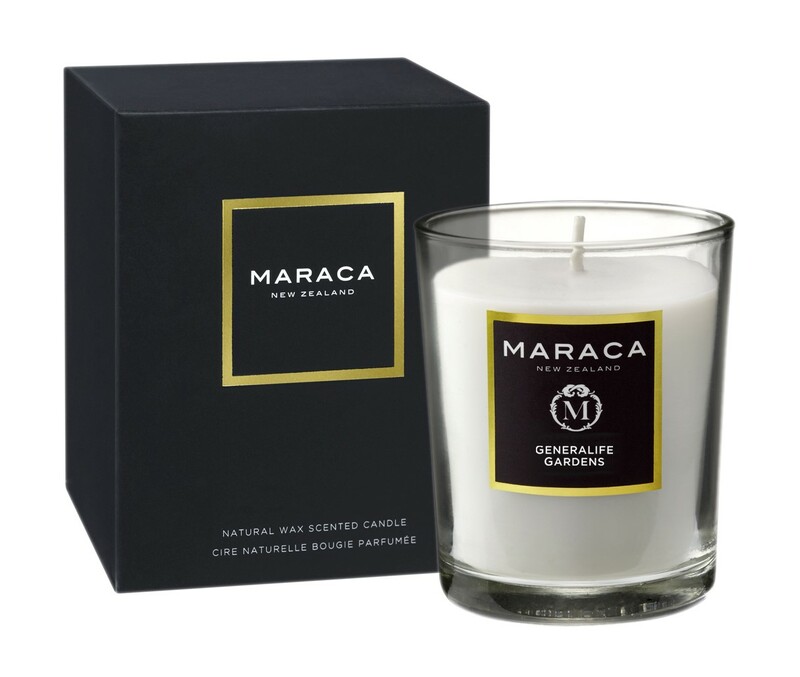 Generalife Gardens’ fragrance is blended with natural soy wax and poured in to an elegant unsealed glass jar. This allows the fragrant earthiness to subtly release its aroma in to the air, even if the candle has not been lit. Each candle uses a lead-free cotton wick and provides a delicately scented burn of up to 45 hours.